Argentina Cavalry (Fatigue Cap-2) [AC-05] - $7.20 : Grenadier Productions,, Home of Liberators! 6 troopers & 6 horses. 2 poses each. Troopers wear fatigue uniform of coat and fatigue cap, armed with lances. 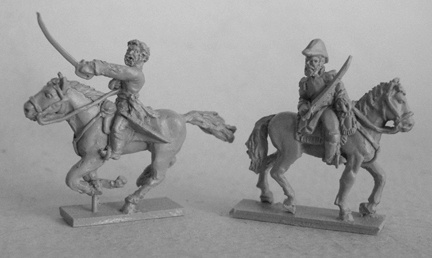 Use these figures for the Granaderos a Caballo (Horse Grenadier) Regiment 1813-1815. These figures are in a fatigue uniform depicted in a contemporary illustration of the Granaderos a Caballo in service in Peru 1820 but the uniform is very similar to that worn by several Argentine cavalry units throughout the war. 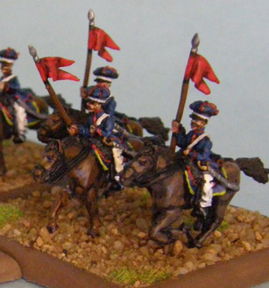 These figures can also any Argentine cavalry unit that you want to arm with lances. Lances were particularly common in Northern Argentina and Southern Bolvia and many units, regardless of technical denomination, likely used them.